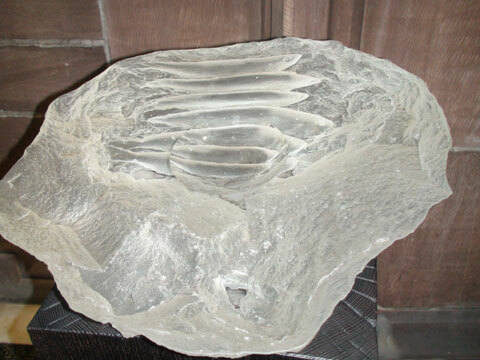 An optical glass font from the V&A, which incorporates the early Christian symbol of a fish, is now on display in the Lady Chapel of Liverpool Cathedral. The work is by the contemporary sculptor Colin Reid, and is on loan to the Cathedral from the Victoria and Albert Museum in London. It is at the Cathedral as part of the prize awarded to the Cathedral by ACE (Art and Christianity Enquiry) for the Tracey Emin neon, For You, above the Great West Doors, and was commissioned by ACE in 2004. It is supported on a wooden plinth designed by Jim Partridge. The design of the font recalls the Greek word for fish, icthys, whose letters represent the words for ‘Jesus Christ God’s Son Saviour.’ The early Christians used the fish image to communicate their baptismal creed. It appears in the 1st century catacombs in Rome and still has a special significance for many Christians today. The sculpture will join the Icons in Transformation exhibition, which features around 180 pieces of art and runs until March 18th.